NO THANKS: There was a time, when my mother went shopping for shoes and deliberately planned to also buy a matching handbag. The saying, "If the shoe fits, buy the matching handbag . . . (Unknown Author), was her mantra. She told me of specialty shoe shops which displayed matching handbags and heels and for my mama, buying a pair of shoes meant buying a handbag - the two went together - you never came home with just one. We don't do that anymore. In fact, we abhor being too "matchy-matchy". 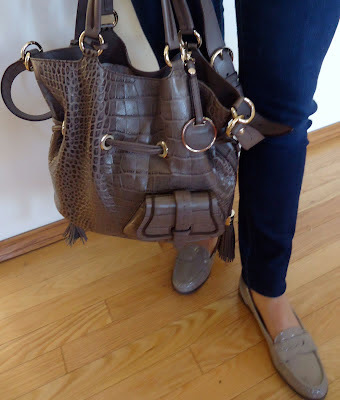 In an April, 2011 post by Liz Jones from the UK Why French Ladies Never Match Their Shoes and Handbags , Jones refers to Parisian Chic by Ines de la Fressange. In her post she illustrates the very fashionable former model with a black croc-style handbag (de la Fressange advises to eliminate the croc-stamp from your handbag wardrobe) and black flats. Looks like a match to me, a colour match at the very least. The photo therefore contradicts two fashion guidelines made in de la Fressange's book. I would like to assert here that for the most part "matching" takes place unintentionally. When one has fallen into a particular shopping style and clothing style, our favourite colours manifest into a wardrobe that quite unintentionally goes together. In the two cases presented in this post, there was no intent on deliberately matching bags and shoes, and for the most part they don't match exactly; it just happened! Here's a good example of Joelle Aidan's unintentional match. 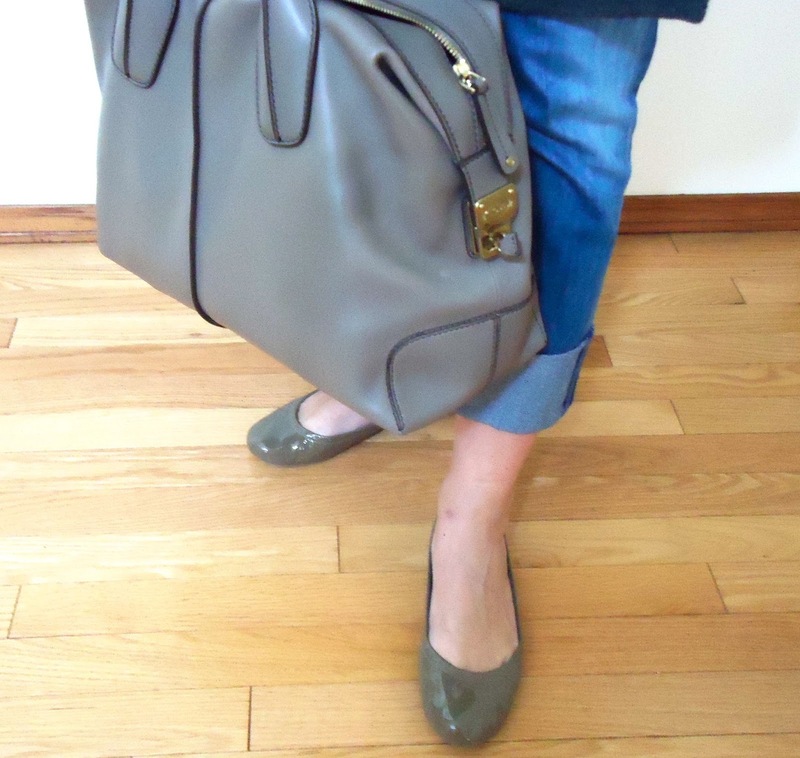 The bag is a Tod's "D bag" bought at Holt Renfrew (Calgary) in December 2011 during their winter clearance sale at 40% off. (I might add that even at 40% off the Tod's bag will run you around $1250.00 (Cdn).) Joelle adds, "I do have to say that I really love that bag. I have found that the color with better quality leather has such a richness and depth, you just can't find that in lesser quality bags. I have even had men compliment me on that bag." The ballet flats are Tory Burch "Eddie ballet flat" bought at the Tory Burch store in San Francisco, September 2011. Officially this does not constitute a match because the leathers are different, one patent, one smooth, but it does make a lovely coincidence. I have experienced the unintentional match with the Ralph Lauren sale loafers and my Lancel bag. The Premier Flirt Lancel handbag was purchased in Paris in September, 2011 and the Ralph Lauren traditional loafers were purchased at The Bay in Saskatoon, Saskatchewan at 70% off during an end-of-winter clearance (less than $35.00 Cdn). The bag has a croc-finish and the loafers are patent in the same tone, so again, not quite but NICE just the same. The Ralph Lauren loafers were purchased because of the price with no mind given to colour. I received the bag as a gift but it was a reciprocal gifting situation for a special occasion - I gave my husband a piece of art and he gave me a Lancel Premier Flirt bag and wallet. Obviously the "match" was unplanned. In a very NOTE-WORTHY kind of way, it can be concluded that matching has become approximate and not so intentional. Excellent post! I just stumbled upon your blog page and gathered some good ideas. Thanks! As a guy I'd like to compliment you on your awesome bag, very nice. I live in Calgary but have never been to Holt Renfrew. As for the color match, they are somewhat similar but because the finish is different it looks awesome. I love those Tory Burch Eddie flats. I bought a pair this Spring in Scottsdale. I got the black patent. Do you find them comfy? I do. I'm glad you found my blog Brian and have taken the time to share. I have one pair of ballet flats, not Tory Burch, and my experience has been discomfort for the most part. Perhaps Joelle will visit and give her assessment of fit and comfort level. Nonetheless, you found a NICE shoe, it fits, it's comfortable, now buy it in triplicate! Perhaps by the time you come back and read this you will have visited Holt Renfrew. I didn't take the time to figure out how to post your photos, if I even can within the "comments". I will explore the possibility. I especially like the one walking with the exposed Tory Burch logo on the sole. And with the same "nosiness" as one of your commenters on the second photo, I am curious about what's in the shopping bag. Here's me wearing them in the order I bought them. 1) - Black patent. These were very hard to break in. And lastly those Eddie flats I showed you last post. I'm not sure how to post pictures to comments either. If you like I could email the pictures to you if that would help. Let me know. Thanks for sharing your wonderful blog. Thank you so much for the offer of emailing the photos. Please do. I can post them in that way and I do want to dedicate a piece to the ballerina/ballet flat and your input would be very helpful and insightful. Perhaps we can collaborate. I have these Puma flats in pretty much every colour they were made in. I would love to collaborate with you on a piece about ballet flats. I am impressed. Encroyable! We shall collaborate. Thanks so much Brian! OMG! I feel like we should have champagne and toast this post and the friendship that developed. I shall toast both here in France and I am hoping you will be able to in Calgary. Making a difference; that has been a motivating goal in my life - I think together we have done that! KLINK! That's the sound of our glasses celebrating this young but meaningful friendship. I can honestly say you have made a difference in my life. Klink! Cheers! Actually you are probably having better weather in Western Canada than we are in the SouthWest of France, but it is lovely and with a shawl, it was comfortable enough to eat outside at 8:00 PM. Klink again - To that which makes friendships begin and grow! It's always great to revisit this post. This is what brought us together as a team. I had forgotten the details about how all of this originated . . . yes in fact, it is very nice to re-visit this post and the comments, particularly just before Christmas . . . it was a gift. Bonne Fete, Joyeux Noel and much happiness and prosperity in 2016. Oops . . . so sorry, hit the wrong button. Good grief. You must send this again. It was so perfect, I can't believe I hit the delete tab. Here we are now coming up on 5 years together as a team. 5 years goes by fast but at least it's time that's been spent with you. Hope you are well my friend. Five years. We obviously have found a mutual vibe that works. I am a tad preoccupied at the moment as can be confirmed by my inadvertently hitting delete buttons. Although it was a teaching experience - there was no pop-up asking, "Are you sure you want this deleted?" or option to cancel with a warning that if you delete it, it's gone. Anyway, I have been writing for the public press, a local lifestyle magazine and have been otherwise occupied. It was very comforting receiving your comment.